Someone's going to get a little taste of our March Fresh Baked Kit -- we've got a Prize Pack with Flair to give away from our Release Day and Blog Hop festivities. We had hundreds of entries, so we hope you played along! 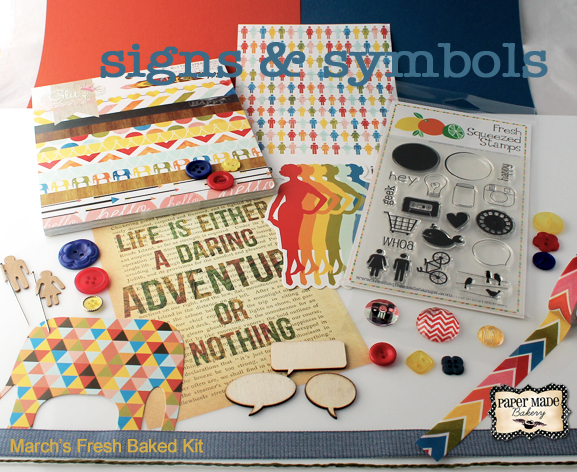 Don't forget to pick up your own Signs & Symbols Fresh Baked Kit HERE, and join our awesome design team in making your own fun cards and projects. Consider becoming a Baker's Dozen kit subscriber and get a Fresh Baked Kit delivered to your doorstep each month -- guaranteed! We can deliver a kit just about anywhere in the world, so if your destination isn't listed on our drop-down order menu, just CONTACT US and we'll make the arrangements! Drop by again tomorrow for more ideas and inspiration from our design team! Thank you soooo much!! I can't wait to play with my new toys. The stamp set is just so adorable, I've had a great time seeing all of the ladies' creations. Oh, you have no idea how thrilled I am!!!! And thank you for your congrats, everyone. Have a great day!!! !